Live the experience and the intensity of a Triathlon event! Become part of the great race and support the organization that is hosted in our city. Become a Technical Official (valid for ages 18+ years). 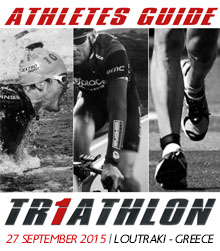 During the organization of the International Triathlon race «2014 ETU Loutraki European Cup & Mediterranean Championships», the weekend of October 17-18, the ITU Technical Officials Level 1 Seminar will be held at the premises of SPORTCAMP in Loutraki by the International Triathlon Union (ITU,). By taking part and completing the seminar successfully the organization will designate you as an International Judge of the International Triathlon Union races in Greece and abroad. The Certification as an International judge will be delivered after participating in the race.